This post is written to protest the reburial and honoring of Lithuanian World War II-era leader and Nazi collaborator, Juozas Ambrazevičius-Brazaitis, Kaunas, May 20, 2012. Historical documents, signed by Ambrazevičius prove that his government cooperated with the Nazis in the persecution of Lithuania’s Jews. The following photos prove the vibrant and difficult life endured in Kelme, a Jewish Shtetl located in in the eastern part of Lower Lithuania. Do you remember sitting on your grandmother’s lap asking her what it was like in the olden-days? If she lived in Eastern-Europe she probably described living in a small, dusty, Jewish town known as a shtetl. Now, you can visit one of these towns and see what life was like…and, it wasn’t easy. 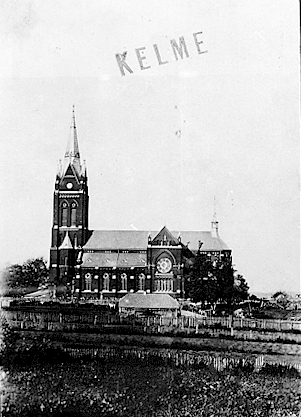 Historical texts first mention Kelme in the early 1400’s, about the same time a wooden Catholic Church was built. 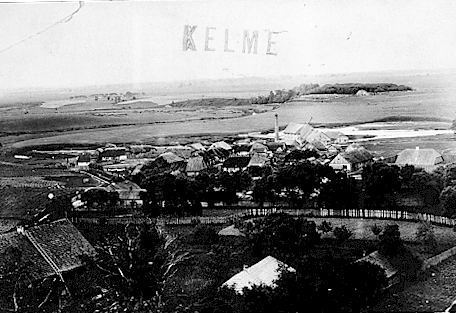 The town grew in importance during the 1600’s when the Gruzevskis family built their estate in the Kelme region. In 1836 construction began on a road connecting Riga to Prussia. 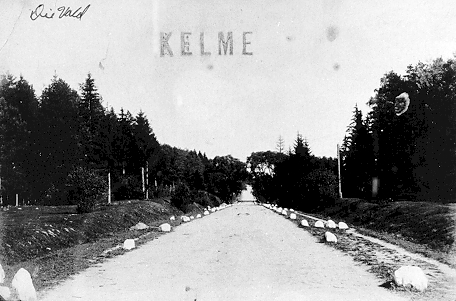 The road, once completed, passed through Kelme, bringing tradesmen and travelers. 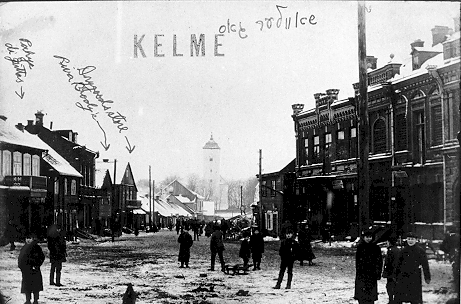 Jews began to settle in Kelme in the mid 1800’s. 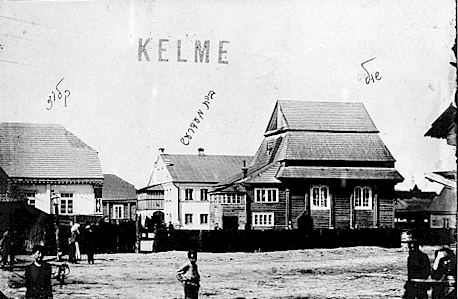 By 1905 95% of Kelme’s population was Jewish. 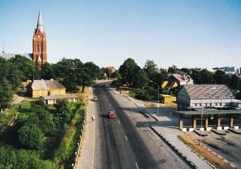 Kelme is situated in the eastern part of Lower Lithuania. The Dubysa and Venta Rivers intersect the Kelme region which includes the town of Kelme, Kraziai and Saukenai. About 25% of the Kelme region is made up of forests and has 53 small lakes. The town of Kelme is located along the west bank of the Krazante River. Today over 43,000 people live in the Kelme area. In the early 1900’s the population was about 4000. 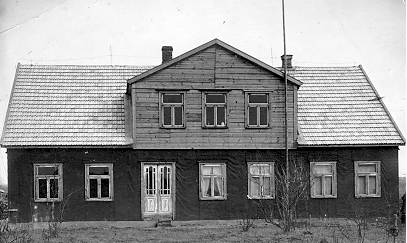 In July 1941 over 300 years of Jewish presence in Kelme came to an end. In that month 2000 Kelme Jews perished in the Holocaust and their homes and possession destroyed or stolen. Their bodies were buried 2 miles outside of town. All that remains of Jewish Kelme is what could not be destroyed – their contribution to Torah thought and observance which, to this day, adds immeasurably to our Jewish heritage. 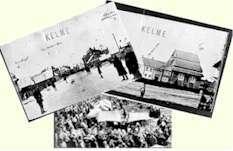 In the early 1900’s nearly all of Kelme’s 3000 residents were Jewish. Kelme had seven synagogues. The largest was the Gross Bet Midrash (house of study), which had 800 members and was headed by Rabbi Zvi Yakov Oppenheim. Other synagogues included the Tehillim Shtieble, Klein Bet Midrash, Shuster Shtieble, Chaiadam Stieble lead by Rabbi Lapin and a Talmud Torah lead by Rabbi Simcha Zicel Braude. The Jews of Kelme worked mostly as tradesmen and merchants: butchers (Kelem had 5 Shochetim), bakers, shoemakers, and horse drawn transportation between cities. There was also a candle factory, tannery, brush factory and watchmaker. 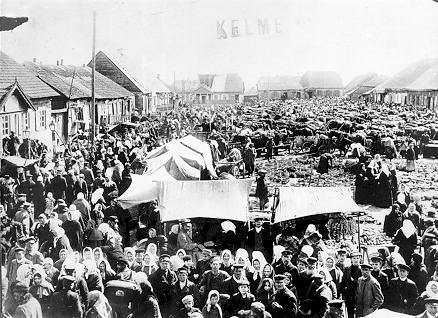 In Lithuania, Kelme was the center of what is known as the Musar Movement. Musar is the Hebrew word for ethics. Adherents to the Musar Movement sought to infuse every aspect of their lives with humility and ethical behavior. The Mussar Movement combined modern understanding of psychology with traditional Jewish theology in an effort to attain personal ethical development. Today the Mussar Movement continues through the study of Mussar related texts, written by the leading Rabbi’s of the day, and historical books, which relate the movements growth and influences. 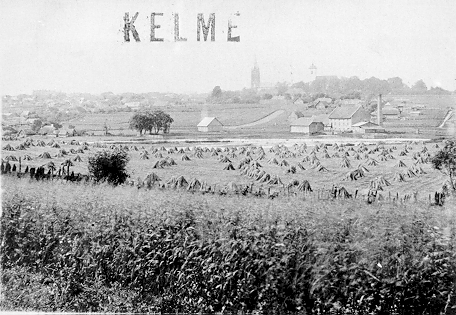 Kelme was surrounded by farmland where most of the Non-Jewish population lived. The German Church appears in the distance. St. Mary's Church is on the right. Surrounding these brick structures were mostly wooden dwellings and store fronts. The taller building is one of Kelmes 7 synagogues. The white building behind the synagogues was a yeshiva/study hall. Jewish synagogues were not permitted to expand horizontally. So, they built up. This is why this Shul has three roofs. Here is another view of a typical Kelme street. Home of Rabbi Fival Krubelnik, murdered along with his wife, child and 2000 other Kelme Jewish citizens. A view of St. Mary's Church. 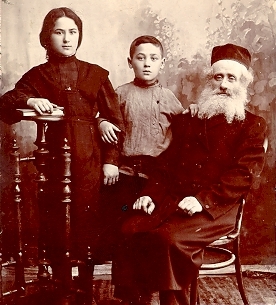 Rachel Malca, Fival and Yosef A of a typical Kelme family and the source for the photos in our virtual tour. Today the Kelme District is home to over 43,000 people. 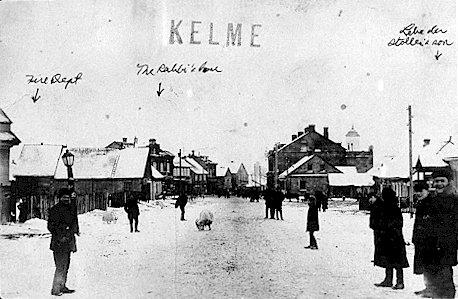 To this day, Kelme is not considered an “important” town. It has not industrialized and is best known for its picturesque landscapes, lakes, and pristine forests….